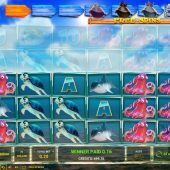 Tidal Riches is a very rare Novomatic cascade slot and works in a similar way to Netent's Asgardian Stones or Pyramid Quest with symbol replacement for winning tiles. The theme is a rather childish and not too different from Playtech's Great Blue although here we have nowhere near the big win potential of that slot! We play to the inevitable watery sounds of bloops and bubbles with transparent tiles over a background of clear ocean and coral with sea creatures featuring on the reels too. So will we find some sunken treasures here, or will our bankroll be quickly swept away with the tide? You will see a standard grid of 5 reels and 3 rows, with one more reel and two more rows greyed out by them. There are 20 fixed pay lines to begin with but as soon as you get one single winning combination the 6th. reel comes into play and you light up the first position on the trail above the grid too. When the 6th. reel is activated you also get paid from right-to-left as well. So it's best we see the symbol pays for 6-of-a-kind wins which are 30x bet for the Dolphin, 25x Octopus, 20x Turtle, 15x Yellow Fish, 10x Striped Fish and 1x for the five different card values. These are all halved for standard 5-of-a-kind wins. Wilds can appear anywhere too and presumably pay the same as the top symbol above. 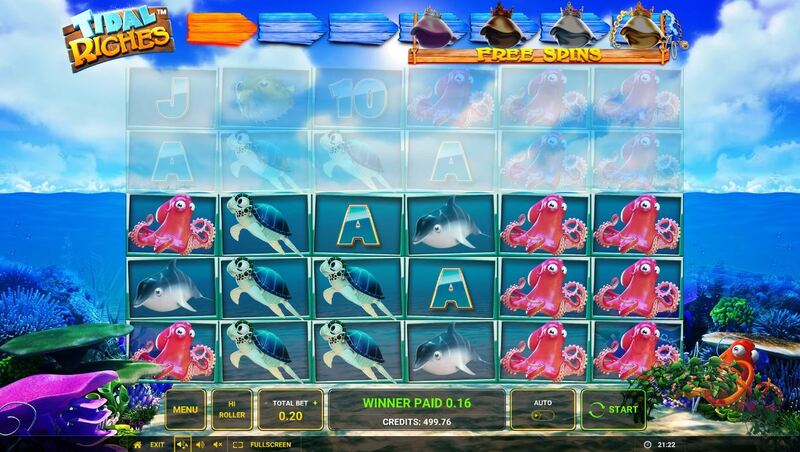 You will earn your free spins as you may have surmised via the trail as there are no scatters. As said, the first win opens up reel 6. The second opens up the first extra row, then the third opens up the second extra row to activate the maximum grid of 6 reels of 5 rows each which then becomes 50 paying lines both ways. Your next win, which if you get one would be your fourth consecutive, then gives 5 free games with single Treasure Chests added to the reels which are mystery symbols. If you get another win your Chests are stacked, a sixth consecutive win adds Mega 2x2 Chests and finally the seventh or more win will make those 2x2 Chests into 3x2 mystery symbol Chests. During free spins the fourth to seventh consecutive wins add 4, 6, 8 or 10 extra spins respectively.